Detroit Pistons’ Andre Drummond booed. Was it deserve? Did Paul George violate unwritten rule vs. Blazers? The discovery of the landing gear comes a day after investigators found the flight data recorder, commonly known as a “black box,” from Lion Air Flight JT610. The discovery should help explain why the new Boeing 737 crashed on Monday, killing all 189 people on board. 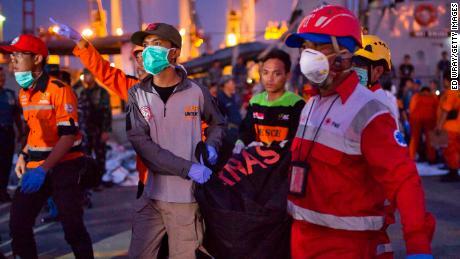 Speaking at a news conference at Tanjung Priok port in Jakarta, Muhammad Syauqi said the search agency used another strategy during its operations to try to locate plane parts. The strategy entailed anchoring a ship belonging to an oil company because the vessel was already well-versed in the location. A remotely operated vehicle (ROV) was also used. Syauqi said divers from the agency, the Navy, and the police were sent to sweep the area. They plan on using a ship crane on Friday to lift up the landing gear debris, Syauqi said. He said that his team had not heard the ping from the cockpit voice recorder (CVR), which records audio from the cockpit. It is thought to be on the seabed, some 35 meters (114 feet) from the surface. 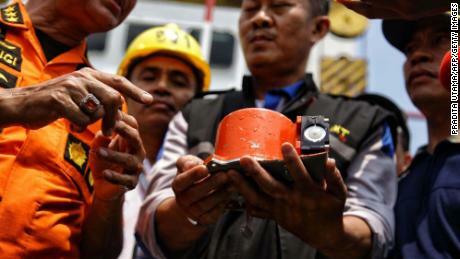 Early Thursday, CNN Indonesia showed images of divers bringing the flight data recorder, commonly known as a “black box,” on board one of the rescue ships in the sea close to Jakarta. Monday’s ill-fated flight crashed 13 minutes after takeoff. 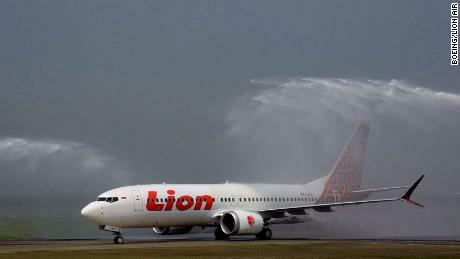 The flight was supposed to be a one-hour flight to Pangkal Pinang on the island of Bangka. National Transportation Safety Commission (KNKT) Deputy Director Haryo Satmiko told CNN that it will take two to three weeks to read the data from flight data recorder, and a further two to three months to analyze it. Capt. Daniel Putut Kuncoro Adi, managing director of Lion Group, which owns Lion Air as well as other airlines, declined to offer any possible explanations to CNN for the crash. “As a company we are waiting for the result from the National Transportation Safety Committee working with the black box” to determine what went wrong, Adi said. He said he believed the pilots did their job “professionally and they struggled to save the aircraft,” and offered his condolences to the families of the victims. The jetliner had experienced technical issues the day before on another route, passengers aboard that flight revealed to CNN. On Sunday the Boeing 737 Max 8 aircraft — a new plane, which only had around 800 flying hours on the clock — had flown Lion Air’s Bali-Jakarta route and had experienced a significant drop in altitude, passenger Robbi Gaharu said. According to Gaharu, a management consultant and frequent flier, Sunday’s Flight JT43 was around two hours late taking off from the Indonesian resort island. “I thought maybe it was caused by turbulence. After 10 minutes in the air the plane dropped as if it was losing power. People panicked. It dropped about 400 feet,” said Gaharu, adding that he had confirmed the height of the drop on a flight tracker website. Bamnang Warsuta, a consultant who said he was also on the flight, described his terror as the plane suddenly dropped. The president of Lion Air confirmed to CNN that the aircraft that crashed on Monday had been used to fly the JT43 Bali-Jakarta route the day before, and Indonesian authorities confirmed that the pilot on Sunday’s flight reported a problem with one of the plane’s instruments. Lion Group’s Daniel Putut said that all information had been handed over to Indonesia’s National Transportation Safety Commission and he could not answer any questions about the fault due to a non-disclosure agreement signed to accommodate the investigation. While no information has been released yet as to why the brand-new plane crashed into the sea 13 minutes after takeoff, FlightRadar24 has published data that shows the plane behaving erratically during takeoff. When a plane would normally be ascending in the first few minutes of flight, the Lion Air jet experienced a 726-foot drop over 21 seconds. Aviation expert David Soucie told CNN that the flight’s last moments were “outside of the normal manual flight mode. On Wednesday, authorities started bringing relatives to the dockside to identify victims’ personal belongings, which lay piled up next to cushions and other debris that appeared to be from the aircraft. 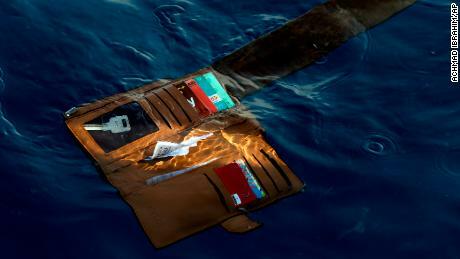 Items fished out of the sea showed wallets and other personal effects, including a child’s Hello Kitty purse. Epi Syamsul Qomar, whose 24-year-old son was on the flight, broke down into tears when he recognized his son’s shoe. Qomar said he believes the body of his son, Muhammad Ravi Andriyan, is still inside the Boeing 737 MAX 8 aircraft. CNN’s Eric Levenson, Ivan Watson, Masrur Jamaluddin, Yosef Riadi and Edi Amin contributed to this report.